Overwatch League has plenty of astoundingly skilled players, but very few stars whose popularity transcends the game’s still relatively niche esports scene. 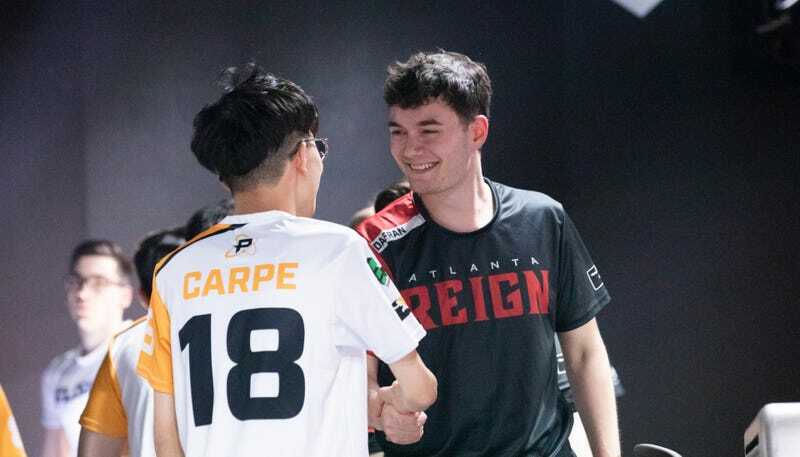 Now it’s time to mark another burgeoning name off the list, because Atlanta Reign’s Daniel “Dafran” Francesca has quit after just one month of play during his debut season. He also referenced the 2017 suspension incident in his goodbye. “At least we are leaving maturely and gracefully after finishing stage 1, unlike the throw4dafran Nekopara Selfless incident,” he wrote. Dafran’s team, Atlanta Reign, also issued a statement on his departure. Dafran will remain partnered with Atlanta, as a streamer instead of a competitive player. Dafran has always been a fan favorite in spite of, and because of, the fact that he’s a giant troll. His hundreds of thousands of fans were thrilled to see him finally join an Overwatch League team this season, and on the field, he mostly lived up to the hype. While other Overwatch League players stuck to tried-and-true strategies, Dafran convinced his teammates to do things like help him ski over a roof and land behind enemy lines in a way even the commentators were shocked to realize was possible. “Going forward I’m going to stream less and focus on making myself and my team better,” he said at the time, suggesting that tensions between streaming, his mental state, and pro play have been wriggling around under his skin for months, at least. This is not the first time a popular OWL player has opted to focus on streaming over continuing their career in Blizzard’s big leagues. At the end of Overwatch League season one, Brandon “Seagull” Larned—who became a star before OWL even started thanks to his high-level play and chill personality—retired to resume a full-time streaming career. His former Dallas Fuel teammate, Felix “xQc” Lengyel, was released from the team during the season after a string of controversies and ultimately chose to focus on streaming. He’s now one of Twitch’s most recognizable faces, for better or worse. Other players, like SF Shock’s Andre “iddqd” Dahlstrom and Houston Outlaws’ Lucas “Mendokusaii” Håkansson, came into OWL with dreams of glory, only to warm the bench for all of season one, ultimately leading them to pursue careers in streaming. Being part of an Overwatch League team is hard work. Teams stick to rigorous, full-day practice and scrimmage schedules on top of weekly games against other teams in front of packed, expectant crowds. That’s a lot of pressure—pressure that has, in the past, led to burnout, stress, and even panic disorders. Next season, teams will move to their respective cities and be expected to travel frequently, potentially adding more stress to the equation. It also takes away from time players could be spending streaming, one of their few obvious post-OWL career options. Streaming is by no means a low-pressure gig, but streamers can make their own schedules and live in their own homes. Add to that increased money-making potential, and it’s not hard to see why popular OWL players would pick streaming in their bedrooms over playing in an arena packed with throngs of screaming fans.